This 1795 square foot, two story home is built on a beautiful wooded lot at 56215 Puma Drive in the Tamarac subdivision. 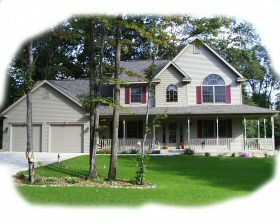 Iit will be perfect for a family looking for a beautiful, quality built, ready to move into home. A first look at this house shows an inviting full front porch that wraps a third of the way around the right side. Upon entry of the house, you walk into a two-story foyer with an open staircase to the second floor. The first floor has a laundry room with washtub, L-shaped kitchen with separate eating area, sliding glass doors to the back patio, large family room with fireplace, french doors leading to a formal living room, formal dining room, and a half bath. The garage has plenty of room for two cars, storage and lawn equipment. The home's three bedrooms are on the second floor. The master bedroom features a tray ceiling and walk-in closet. The master bath has double sinks and a linen closet. The second full bath also has its own linen closet. Bedrooms 2 and 3 are down the hall from the master bedroom. The home's unfinished basement will house an energy efficient furnace and water heater. It will also have 8-foot ceilings and an egress window system. Your dream home can become a reality with Muehlberger Custom Homes. When you build a home with Bruce, you have not just closed a deal, but established a relationship that will make you secure in the feeling that your dream home will become a reality.